New Jersey online gambling has just taken a giant leap forward to the future with the launch of Live Dealer at GoldenNuggetCasino.com, the first gaming platform of its kind in America. Sign up as a new player using the Golden Nugget bonus code PLAY20 (or simply use one of the links on this page), and you’ll be eligible for one of the most generous NJ signup bonuses – $20 free and a 100% deposit bonus, up to $1,500. The free $20 is a no deposit bonus, meaning you can claim it without ever reaching into your wallet. The match bonus of 100% up to $1,500 must be cleared before it can be withdrawn. When the nationally-known hospitality, entertainment, and restaurant company Landry’s, Inc. purchased the former Trump Marina in 2011 and proclaimed “out with the old, in with the gold,” and urged AC gamblers to “watch the transformation,” the new owners wasted no time delivering on their promise. If the sale hadn’t happened, this struggling property could have been one of the first casualties on the now-growing list of casino closures. However, Landry’s, Inc., owner of multiple other Golden Nugget casino properties, had much loftier plans for the newest Golden Nugget. And the $200 million investment on top of the original purchase price paid off big time as Golden Nugget Atlantic City reemerged and firmly established itself as one of the region’s most successful properties. Golden Nugget Atlantic City is a lot more than just a place to gamble. It is also home to signature world-class restaurants, Haven Nightclub, more great entertainment options at the Deck and H20 poolside lounge, and all the other amenities of a first class resort. Two years after its opening, another exciting chapter in New Jersey gambling history began. On November 26, 2013, New Jersey became the third state in the country to officially launch legalized online gambling. This mode of play offers a tremendous convenience to people who love casino games, but for a variety of reasons, might not be able to get to the Atlantic City casinos very often. You don’t even have to be a New Jersey resident. As long as you are within state borders at the time of your play (and of age), you can play online or on your mobile device to your heart’s content! Today, New Jersey players can choose from 13 online casinos, but GoldenNuggetCasino.com outshines them all in total number of games. More importantly, this is not some haphazard array of games where finding one you actually like is hit or miss. Not only are all of the games top quality, but the user-friendly website organizes them into convenient categories to narrow down your search. There is no doubt that being able to play your favorite casino games online on your PC, smartphone or tablet is a tremendous convenience for gamblers. When your busy schedule doesn’t allow time to make the trip to Atlantic City, you don’t have to deprive yourself of the fun and games. You save on travel, food, and hotel costs, too, which leaves more money in your budget for game play. But those are far from the only advantages you get as an online player. The generous offer you receive when you sign up at GoldenNuggetCasino.com is only a prelude to many more offers and promotions coming your way if you play on the site regularly. There is one thing missing, though – the electric energy of the casino environment itself, along with the social interaction that presumably can only come from playing in a real casino. However, the assumption that those aspects of the gambling experience can’t be found online is unfounded. GoldenNuggetCasino.com has solved the problem! Although I knew that online live dealer games already existed at many foreign-based casinos, being a US resident, I had no access to these games. So when online gambling came to New Jersey, naturally I was disappointed that no New Jersey casino was offering them. But nearly three years after the launch of NJ online gambling, the Golden Nugget Casino has received approval from the New Jersey Division of Gaming Enforcement to offer this fantastic alternative way of playing online. On Thursday, August 11, 2016, I was there for the 6 p.m. official unveiling. Then without further ado, two strikingly beautiful girls in very skimpy but glittering attire cut the gold ribbon and live dealer play was officially available to the public. Everyone in the industry will be watching closely to see how this fantastic new chapter in New Jersey online gambling unfolds. Golden Nugget Atlantic City partnered with the software company and live dealer gaming specialist Ezugi to develop the new platform. Ezugi already has an impressive and established record, including pioneering the live dealer Omni channel as well as developing mobile solutions, social gaming, white labels, and remote studio installations for other properties. But like the Golden Nugget itself, they needed the approval of the DGE in order for this partnership to materialize. 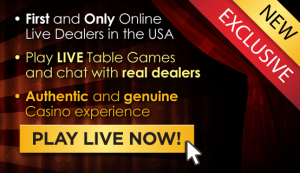 Ezugi is currently the first and only licensed and regulated supplier of live dealer games in the US. Collaborating with Ezugi, Golden Nugget has created a sophisticated studio on the ground floor of its Atlantic City property from which to offer the new digital gaming platform. The room from which the games are broadcast looks exactly like it is part of the regular casino floor. The tables and betting layouts are also identical to those on the casino floor, and an attractive dealer behind each table completes the look. But instead of your having to visit the casino to enjoy the action, the games are broadcast from the studio so you can play at home or wherever you happen to be in New Jersey. Through advanced online gaming technology, the games are fed by live streaming to your computer or mobile device screen so that all of the action can take place in real time just as if it were taking place inside the casino. Unlike the other online games, where bets can be placed either for play money or real money, the live dealer games are for real money only. However, this makes the games more like those in a real casino, where play money bets are also not an option. While playing, you are free to interact with and carry on a conversation with the dealer and other players at the table, just like you would at Golden Nugget Atlantic City or any other brick and mortar casino. This feature, more than any other, bridges the gap between online play and playing in a real casino and has to be experienced to be believed. It is hard to imagine that so much is possible on the screen of your computer or smartphone; you will almost be tricked into thinking that you are indeed playing at a real table in a real casino. When I asked about the dealers’ training, Dennis Gallagher, Director of Customer Service – Online Gaming at Golden Nugget Atlantic City, was very candid. He admitted that the dealers are hired more for their eye candy than their extensive gaming knowledge and experience. What counts is that they are beautiful to look at and have a beautiful smile. But if you are worried that they might make mistakes or deal too slowly, don’t be. The Live Dealer games proceed at a lively pace since all of the payouts are accurately calculated in microseconds and displayed in real time on the player’s screen. Unlike Golden Nugget Atlantic City and also the rest of GoldenNuggetCasino.com, online live dealers are not offered 24/7. Currently the games are available daily, but only between 3 p.m. and 3 a.m. Eastern Time, which the casino finds are its busiest periods, with the most traffic. Depending on the response, there is a strong possibility that the operating hours will be expanded. Golden Nugget’s newest online live dealer game, Casino Hold’em, joined the lineup in December 2017. Look for more information about the poker variant here. In the meantime, the following is a brief description of the other games, and we’ll get more deeply into the details of each elsewhere on this site. Each live dealer Blackjack table offers the same game, which is similar in most respects to the blackjack games offered at Atlantic City casinos like the Golden Nugget. At these tables, however, the minimum bet is lower than what you may be accustomed to in Atlantic City. All Blackjack tables, open daily, have a $10 minimum bet. These minimums are in sharp contrast to those at Golden Nugget Atlantic City and other Atlantic City casinos, particularly on weekends, when all of the blackjack table minimums are likely to be $15 and higher. Finding an open $5 or $10 blackjack table in Atlantic City is never easy, and if you visit any of the Atlantic City casinos on a weekend or holiday, such tables are virtually nonexistent. Of course, if you wish to bet more than the minimum on live dealer blackjack, then a wide range of higher bets are also accepted. The maximum bet at both tables is $1,000. Players can occupy two hands at a time at the same table, and multi-tabling is not allowed. The rule that the dealer must hit rather than stand on soft 17 works against the player because it gives the dealer additional opportunities to turn a mediocre hand into a better one. On the other hand, the Late Surrender option, which no Atlantic City casino offers anymore, helps the player a little. Late Surrender means that players have the option to forfeit half of their bet on a hand they don’t like, but only if the dealer doesn’t have a blackjack. If you wish, in addition to your regular blackjack bet, Live Dealer Blackjack at GoldenNuggetCasino.com offers two optional side bets: Perfect Pairs and 21+3. The payouts for this game are 6:1 for a mixed pair, 12:1 for a pair of the same color, and 25:1 for a Perfect Pair. When you make this bet, you’re hoping your first two cards and the dealer’s upcard together will create a nice poker hand. More specifically, in order to win, the combined hand must be a flush, straight, three of a kind, straight flush, or three identical cards. Keep in mind that these side bets have a higher house edge than the standard blackjack bets. As an occasional small bet, they can make the game more fun, but don’t get in the habit of making such bets regularly. Another live dealer blackjack option that exists in some foreign casinos is “Bet Behind.” If a player has been having bad luck and sees another player having good luck, he or she can place a bet behind that of the lucky player, hoping that the lucky streak will continue. According to Online Gaming Director of Customer Service Dennis Gallagher, “Bet Behind” is definitely a possibility at Golden Nugget. Although there is no extra advantage to the player statistically, many players would probably like this option. It also keeps them engaged while waiting for a spot to open up at a full table. As you are probably aware, blackjack is a game where the outcome is determined by a combination of both skill and luck. However, unlike the other forms of blackjack that you can play online on GoldenNuggetCasino.com, live dealer blackjack does not give you the option to practice with play money. Therefore, if you are new to blackjack or your skills are rusty, be sure to familiarize yourself with basic strategy before you start playing. By the way, many players wonder if card counting works for online blackjack, so here is your answer. Ordinarily, the games use a continuous shuffling machine that shuffles the cards after every hand, so card counting is pointless. In the Golden Nugget live dealer blackjack game, rather than the cards being shuffled after every hand, they are shuffled when the cut card comes up, which is about halfway through the eight-deck shoe. With so many cards never being dealt at all, the likelihood of having a reliable count high enough to provide meaningful information about the high-low distribution of upcoming cards is extremely unlikely. However, unlike with computer-dealt Blackjack, it can potentially happen. Golden Nugget Online Casino offers a variety of ways to play this popular game, including both American Roulette and a more favorable version of the game called European Roulette. The difference is that European Roulette has only one zero on the wheel, whereas American Roulette has two–both a single zero and a double zero. The addition of the double zero raises the house edge from 2.70% to 5.26%. Unfortunately, at this time, the only form of live dealer roulette that is available is American Roulette. The minimum bet is $1 and the maximum is $1,000. Live Dealer Roulette players can access history stats, including “hot” and “cold” numbers, last numbers, and a “hit radar” showing the frequency of the most recent numbers. Many roulette players like to use this information in deciding which numbers appear to be either “lucky” or “overdue.” However, the bottom line is that doing so will have no effect on your odds of winning since each spin is independent and random. If you play, make sure you’re enjoying the live dealer experience specifically, because you’ll do better at a European Roulette table without a live dealer. Dragon Bonus Baccarat offers an optional side bet which pays out not only when your hand is a natural winner, but also when it wins by a large margin. You can make this wager in conjunction with either a player bet or banker bet. However, the house edge is substantially higher with a bet on banker. The highest payout for the Dragon Bonus side bet occurs with a non-natural that wins by nine points. If you choose not to place the side bet, the house edge remains low as is typical for baccarat. The minimum bet for this game is $1 and the maximum is $1000. While these three games comprise your current Live Dealer options, depending on player interest, Golden Nugget could be adding other games soon. We will keep you apprised of any new developments, including the possibility of additional betting options on existing games, too, as well as expanded hours based on player demand. All of the Golden Nugget Live Dealer Games can be played either online or on compatible mobile devices anywhere in New Jersey. As of this writing, the only supported devices are iOS and Android smartphones. However, play on tablets is expected to be available soon. Loyalty points based on play on any of the three live dealer games are earned at the same rate as your play on other table games. For every $100 wagered, players receive 1 Golden Point. Every 100 Golden Points earned is redeemable for $1 cash. Online live dealer offers an immersive experience different from anything you have encountered before. But don’t worry because the games are being conducted under the watchful eye of the DGE and are every bit as safe as secure as the other online casino games. If up until now you have stayed away from online gambling because playing by yourself on the computer wasn’t your thing, you should consider trying the live dealer games to see how similar they are to playing in a real casino. If you already play online, these games offer an unparalleled opportunity to take your play to a whole new level. Over the next six months, live dealer games will remain exclusively at Golden Nugget Casino online. Afterwards, there is a possibility that other New Jersey online casinos will also come aboard. GoldenNuggetCasino.com was voted Operator of the Year in 2015 and again in 2016 at the iGaming North America Awards. More than 100 players turned out for the live dealer games on opening night, so clearly, this addition to the Golden Nugget online and mobile casino is off to a rousing start. Whether you’re already a regular online player or not, you should visit and experience for yourself this compelling way of playing. Congratulations to the Golden Nugget Atlantic City for being the first online casino to bring live dealer online casino gambling to America.